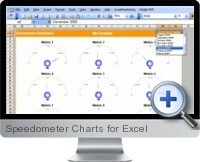 The Speedometer Charts for Excel provide a dashboard of nine speedometer style gauges for analyzing business metrics and key performance indicators (KPIs) at a glance. The speedometer charts read from any Excel structured data to automatically update and also provide the ability to change source field categories from a drop down menu to view alternative data such as different time periods. The charts are simple and easy to set up with existing data and update automatically from changes in underlying data. The speedometer dashboard template can be copied and modified to suit specific business reporting requirements. Multiple speedometer chart dashboards can be used for large scale presentation and reporting. A drill down feature allows the speedometer charts to read from alternative sections of the data to show trends over time or any other data characteristic. Automatically publish the speedometer chart dashboards in HTML for online publishing. The charts come with unlimited upgrades to new newer versions as well as access to information and tools to enhance dashboard reporting for business improvement.